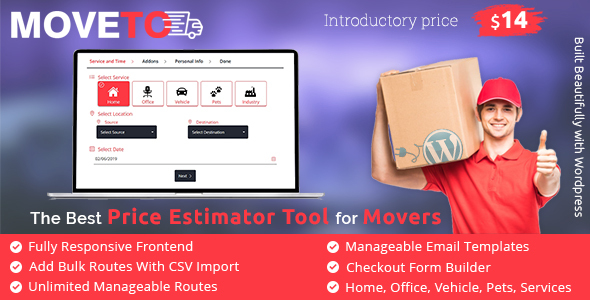 Moveto is a quote form or price estimator wordpress plugin for movers n packers or moving companies to get leads for their business, its very easy to use and very effective which can help their client to get the quote from movers website only and it will be helpful for the company owners to get new leads for their moving business. Moveto is built in wordpress and having very nice quote form and easy to process the quote from wordpress admin for business owner. Moveto can use for almost all type of services movers like Home,Office,Vehicle,Pets,Commercial,etc. MoveTo: Your Search of Perfect Quote Form gets Over here. Moveto is built in WordPress and have very nice quote form, it is quite easy to execute the quote from WordPress admin for the business owner. Routes/ Sources and Destinations can be managed in the most convenient way. Moveto can be used for almost all types of services in moving and packing industry like Home, Office, Vehicle, Pets, Commercial, etc. Its an automated online plugin for businesses having varieties of features. It is fully responsive which makes moveto more convenient in use. It has a powerful admin area which is complete analytics of the business. Here administrator gets complete leads report. It has a customer dashboard to view existing requests through which customers can view their existing requests and can manage them. It has checkout form builder which is a unique feature of it through which you can get complete detail of customers by adding various form fields. In short, it is an ideal quotation form for a Packing and Moving company.